I know he’s normally a chocolate guy, but hey- I was just trying to be supportive of his healthy eating of late. Obviously that wasn’t appreciated, and to be honest, I’d forgotten the rule that desserts on one’s birthday contain no calories. Since Renshi couldn’t think of what he wanted, he spent some time on Pinterest (not kidding here) and sent me a couple of links. One was for these Twix Brownies from Jasey’s Crazy Daisy, which had been on my radar for a few weeks, and I was happy to have an excuse to make them. (Like I need an excuse to make something with chocolate and caramel in it, right? ) Click for recipe. 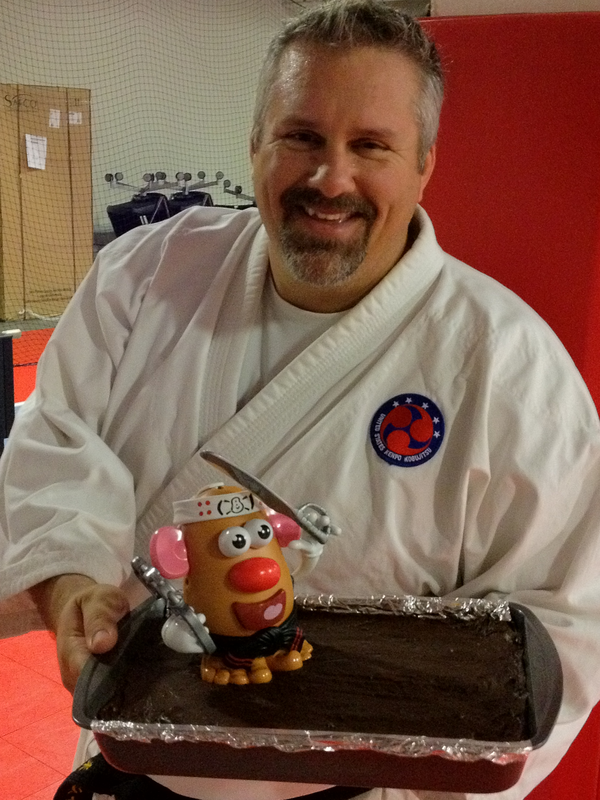 Karate Chips guards Renshi’s Twix Brownies from all the hungry ninjas! Anyhoo — these brownies are a 4-layer delight! 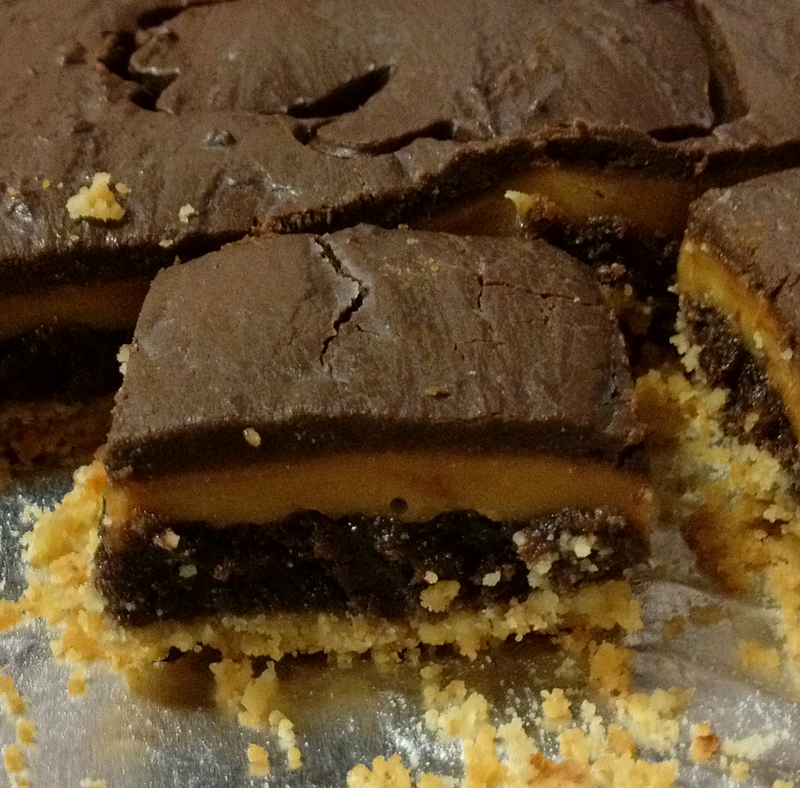 Crunchy shortbread crust, fudgy brownie, sweet caramel, and a final layer of chocolate ganache sweetness. Oh yummy! Easy to make? Well, yeah…sorta. There is nothing complicated about any of the layers, but there are four of them. Fast to make? No. You have to plan ahead with these because of the cooling time between a couple of the layers. Just something to keep in mind. But worth the time these take? Absolutely! They’re delicious just the way they are (I actually followed the recipe – no tweaks! ), but can’t help wondering what they’d be like with the addition of nuts. But then they wouldn’t be a Twix Brownie anymore because the nuts would turn them into Turtle Brownies. Not that I have a problem with that, because I think that’s one of the best flavor combos around. Hmm…I might give that a try next time. I love Twix too! These are so rich they’re hard to binge on – they’re definitely something to share with a group.